At the recent London Brewers Alliance festival held at Fuller’s – the first the organisation had thrown since 2013 – there was an unmistakable air of calm and jollity. Brewers large and small linked arms in celebration of London’s beer scene. There was no infighting between the Anheuser Busch-InBev owned Camden Town and Beavertown (which recently received a £40 million investment from Heineken for a 49% stake in the business) over who was going to have the biggest brewery in North London. And there was no scrapping between smaller, younger brewers like Boxcar or Bohem over who was going to get their beer on the soon-to-be-vacant taps within independent bars that used to pour Gamma Ray. London’s beer scene is one of diversity, inclusivity and – after leaving the London Brewers Alliance Festival with a smile on my face – I feel it’s also one of increasing maturity. It’s home to over 110 breweries, up from just 10 a decade ago. This fresh abundance of brewing talent in the capital has also allowed a rising number of pubs, bars and bottleshops to flourish. As London’s scene becomes ever more pervasive, while also becoming wiser and more experienced, it’s fair to say that the city has charted a course toward becoming one of the most well-regarded beer destinations in the world. With prosperity, however, comes new challenges. Craft beer in the UK only accounts for 5.5% of the market according to data firm CGA – a paltry figure when compared to the 14% share boasted by the US. The reality is that 95% of the beer market in Britain is still controlled by the largest brewery groups, such as AB-InBev, Molson Coors, Heineken and Carlsberg. Via a network of thousands of ‘tied houses’ – pubs that can only get hold of a limited selection of beer through one or more of these large companies – and a stranglehold on supermarket shelf real estate, the largest players make breaking into the mainstream market very difficult indeed. This means the UK’s 2000 independent breweries are competing within that same 5% of the market. And much of this market is within London itself. An increasing number of small, independent brewing businesses are looking to London as part of their expansion plans. Bristol’s Moor Brewing Company has already opened a bar on South London’s ‘Bermondsey Beer Mile’, just four doors down from local business Brew by Numbers. Manchester’s Cloudwater has acquired the space directly in between the two of them. Cornwall’s Verdant is to collaborate on a bar in Hackney, East London with Pressure Drop Brewery, while Yorkshire’s Northern Monk has its sights firmly set on a London brewpub. 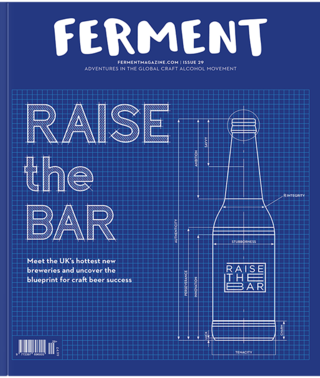 On the surface, competition in London’s beer market seems to be heating up. There’s little doubt that London’s beer industry will continue to grow over the next few years. But what could all of this increased competition mean for London’s existing independent beer businesses? How much of a good thing is too much? Duckworth is full of positivity about the interest fellow small brewery owners are showing in the London market. He’s also brimming with excitement at the prospect of the new Verdant taproom. He also says that as his brewery expands he too would like to establish Affinity taprooms in other UK locations, but warns of the dangers of comparing his business to others. His point is salient: what might prove effective for one brand may not click with another. Bristol’s Moor Brewery opened the doors of its London venue and distribution warehouse, ‘The Moor Beer Vaults’ in December 2017. It’s less than a mile away from Affinity’s space, in Bermondsey, one of London’s biggest beer hotspots, now home to more than 10 breweries. It’s also home to a cider maker, wine shops, distilleries and restaurants, making the South East London district one of the city’s must-visit attractions. Its London space also allows Moor to expand its barrel ageing project. The very existence of an increasingly interesting range of beers is having a beneficial effect on all the breweries who trade on the mile. Taprooms used to open exclusively on a Saturday, but as space increases, facilities improve and awareness grows, these businesses are able to operate for longer hours. Fourpure, at the very end (or start, depending on your route) of the mile is already opening its taproom six days a week. As its peers also begin to do the same it means not only will they be able to increase their revenue streams, but they will also create more jobs, demonstrating how the competitive nature of the scene is actually to its benefit. One thing that’s evident from the moves being made by the likes of Moor and Verdant is that the direct-to-consumer model is becoming ever more popular among the UK’s small breweries. This isn’t surprising. In the US, Trillium in Boston is able to sell near 99% of its product direct from its own bars and retail outlets. Not only does this increase profit margins but it also keeps quality control firmly in the hands of the producer. Better product at better pricing is win/win for the consumer. But how does this affect other independent retailers? Ferguson goes on to say that, in essence, the modern bottle shop is more than just a bottle shop. These days the best kind of beer venues act as community hubs, much like a traditional public house has done for the past few decades. The evolution of those classic boozers just means that they now take many guises, be they taprooms, bottle shops or a great many other forms. And, in trying to unearth the grim, competitive side of London’s modern beer scene, instead I found one of mutual support and camaraderie. The capitals beer scene is definitely busy, but a long way from its saturation point.